Back in April 2016, toy industry veteran David Silva launched a Kickstarter campaign to produce scientifically accurate "raptor" (eudromaeosaur) figures. Unlike the vast majority of static PVC dinosaur figures on the market, these would be super articulated, with up to 24 joints allowing significant posability. Now, over two years later, the project has become a reality, and my selection of a Wave 2 Tsaagan mangas figure has finally arrived. So, how does it stack up to the high expectations and lofty claims that these are the most scientifically correct dinosaur action figures on the market? All of the Beasts of the Mesozoic Raptor Series figures come with box art painted by paleoartist Jonathan Kuo, and it really looks great. As you can see from the photos, the package features a large window box with a removable side cover with Kuo's art on the front and a second piece featuring info about the dinosaur on the back. This removable sidebar is handy for anyone who wants to keep and admire the art but doesn't want to hang onto a lot of bulky packages. The fact that the "vital statistics" are included on this slip cover reminds me of the old days, when we'd cut out and save info cards from Ninja Turtles packaging. The above photo shows the cardboard art and info cover removed from the main box. It slips on tight so it won't come loose unless you want it to. I think I must have gotten an error variant, because the location is listed as the Horseshoe Canyon Formation of Canada rather than the correct Djadochta Formation of Mongolia, but all the other info is right. Well, except maybe that "known from a single skull and neck vertebrae" bit. It has recently been argued (convincingly, in my opinion) that Tsaagan is the same animal as the much better preserved type specimen of Linheraptor exquisitus, which actually has its own action figure in this line! (See this post from Micky Mortimer for a detailed discussion of the synonymy issue). Under the art/info slip cover is a set of simple instructions for safely removing the figure from its packaging and assembling the included base and tail piece, which comes detached in the box. These instructions, plus an insert that came in the shipping box warning customers not to force stiff joints but instead heat them under hot water or a hairdryer, made me immediately nervous that I was going to break this thing. The fact that my 4 year old was helping out with my unboxing and photo shoot didn't help (other than briefly losing the stand clip behind the couch, she did a great job!). But it soon became apparent that the figure was more durable than I expected. The knee joints on my sample were very tight, but not so tight that they felt like they were going to snap. The other joints were a bit looser, especially the small joints around the ankles and toes, which easily give out under the weight of the figure if not supported by a wing and/or the tail. Anyone who owns one of these poseable figures will immediately realize why Safari always needs to make their static models in tripod poses. The tail itself is made of soft, bendable rubber (think Gumby), and is obviously detachable. One nice feature is that there are two sockets on the body to receive the tail's ball joint, at different angles. The default lower socket gives the tail base a sharp upward angle, which looks great of jumping or attack poses but awkward for standing or sitting ones. It's easy enough to pop out the tail base and switch it to the upper socket to achieve a straight or downward angle. ...and then using the upper ball socket to adjust the angle. The rest of the parts are made with stiffer plastic, with the exception of the wings and the middle neck piece (a "mane" of feathers") which allows some extra give and flexibility, though I still found it difficult to get the neck into many different poses without feeling like it was going to disarticulate (given the nature of the Tsaagan type specimen, maybe this is appropriate). The base is nicely detailed and made of sturdy plastic, with a socket in the middle than can receive the stand. The stand itself comes with two clips, one that will cradle the figure's belly as a support, and the other that will more tightly clip onto the underside of the body just anterior to the pubis, allowing for jumping poses. The figure is quite front heavy (my daughter: "This bird just won't stand up!" Me: "Stem-bird, sweetie. "), so the stand is absolutely necessary for any poses that don't involve a third point of contact with the ground (e.g. wing tip or tail). The underside of the stand includes a set of small inset pegs that can hold onto the extra toe pieces when not in use. The box also includes an environmental cardboard backdrop as an insert that can be removed and used for display. This appears to be a faithful recreation of the modern day Flaming Cliffs of Mongolia which represent the same region where Tsaagan fossils are found. The head of the Tsaagan figure is nicely painted yellow and black, with a dark wash that adds some personality. The eyes are dark red with (maybe unrealistically) off-center pupils that, in my sample, don't quite match on opposite sides. The gray feathering begins a bit behind the skull, perhaps inspired by the many bare-headed Tsaagan reconstructions floating around out there. 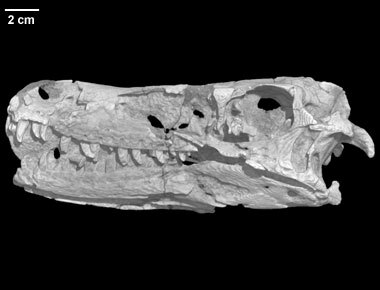 Above is a scan of the Tsaagan holotype skull from DigiMorph. You can see that the overall shape of the figure's head matches this very well, with a smoothly concave top surface and relatively high, rounded snout. The lips of the figure somewhat mask the teeth, though it's hard to get the mouth to close all the way (I think the jaw joint is getting in the way. The figure also seems to have a slight underbite when the mouth is fully closed, as the jaw joint might be forcing the whole piece forward. The oral soft tissue is painted dark pink and is very glossy compared to the exterior paint, giving it a wet appearance. The neck and torso are built from several segments, most of them seem to be jointed. This is a function of the way the Kickstarter series was planned - mix-and-matching a small number of different parts to create a variety of similar species. The gray and earth tone paint scheme works, though, to create a believable looking animal despite the obvious segments. The body of Tsaagan is unknown, but since Tsaagan is similar enough to Linheraptor that they may be considered synonyms, I'll use Lineheraptor as a baseline for this review. 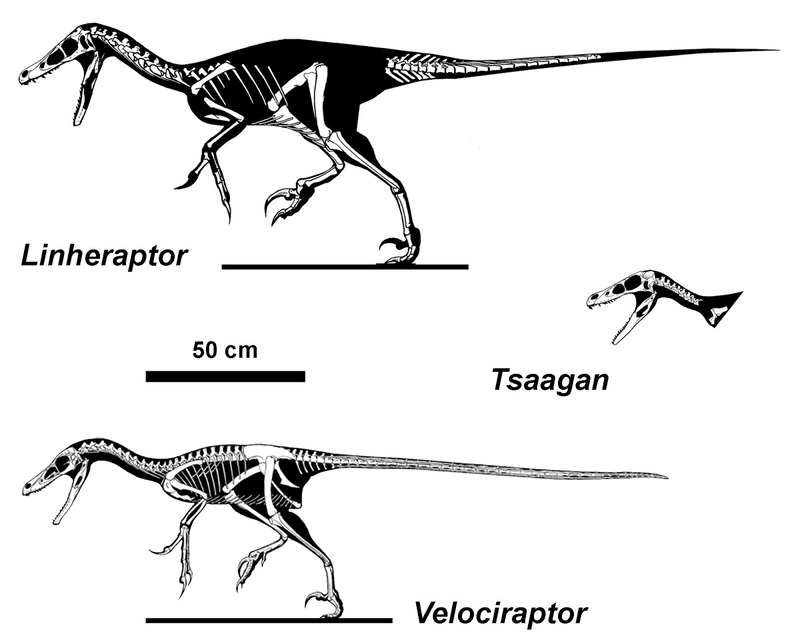 A skeletal by Jaime Headden (CC-BY-3.0) is included below which compares Lineheraptor to Tsaagan and Velociraptor. As you can see, my one complaint, proportion wise, is that the head of the action figure is a little too big compared to the body, specifically when compared with the hind limb element lengths. This seems to be an issue common to many of the BotM Raptor Series figures, which all have pretty short legs and were obviously all spinoffs of a more Velociraptor-like template. It probably would have been worthwhile to sculpt at least a variant lower leg piece that would have been around a quarter longer to accommodate longer-legged dromaeosaurid species. That said, the difference here is not that extreme compared to say, Dromaeosaurus or Zhenyuanlong. If you accept the Tsaagan holotype as merely an immature morph of Linheraptor, you could also write off the proportional differences as ontogenetic. This would obviously be harder to do if you own both Tsaagan AND Lineheraptor figures, since Lineheraptor is obviously much larger than Tsaagan and as far as I can tell all of the Raptor Series figures are identical in size. As for internal proportions, note that in Linheraptor/Tsaagan, the upper arm (humerus) is about half the length of the upper leg (femur), and the radius of the lower arm is less than half the tibia length. In the figure, the upper arm piece is about 3cm long, while the upper leg is about 5cm from hip to knee, so it should be a centimeter or so longer. Likewise, the lower arm is 2.5cm from wrist to elbow while the lower leg is 4cm from knee to ankle. An extra 1.5-2cm of length there would probably have been appropriate. Overall, the hind limbs are a little under-scaled compared to the forelimbs, head, and neck, which may help explain the front-heaviness of the figure. The tail is bendable, as discussed above, which is nice - it would have been tempting to make it a stiff piece of plastic, but we know from fossils that dromaeosaurid tails were more flexible than they look. The tail feather fan is restricted to the distal 1/3 of the tail in all of these raptor figures, which as I've talked about in previous blog posts, is really a meme based on Microraptor and Caudipteryx, when we would have seen more diversity, and in Zhenyuanlong in particular the fan extended to the hips like in Archaeopteryx and Anchiornis. I wonder if the base of the tail should be thicker - to accommodate more muscles plus the relatively thick feathering you usually find in this area (again, this would have helped make the figure less front-heavy). The forelimbs of this figure are both my favorite and least favorite thing about it. The feathers look really phenomenal. Part of the reason I chose this figure over the other options available from the Kickstarter campaign was that the wing feathers looked really nice, with their slight separation, compared to the continuous surface of some other models. Most of the wing pieces in this series are far, far too small compared to the body based on what we know of comparably-sized terrestrial dromaeosaurids, like Zhenyuanlong, which had Archaeopteryx-like wing feather proportions despite being in the same size class as these velociraptorines. But the Tsaagan wing feathers look more decorative, which implies a display function, and we have examples of wing reduction along with display function in other pennaraptoran species like Caudipteryx. So, I think the wing size for the Tsaagan figure is plausible, as far as that goes. The detailing on the primary and secondary wing feathers is excellent, with layered earth tones and dark tips. Of course, readers of this blog can probably guess where I'm going to say the sculptor went wrong. The only thing keeping this from being a near perfect, scientifically grounded figure, are those hands. The hands are separately sculpted pieces, but why did they need to be? A glance at how wing anatomy works will show that the hands of pennaraptoran dinosaurs are the interior foundation of the wing, not a separate structure tacked to the underside of the feathers as they are here. I'm confused as to why they would even need to be sculpted separately, considering that they are glued firmly to the primary feather piece. I assume that it would have been easier and cheaper to actually go the scientifically accurate route and sculpt the alular digit as part of the wing with the claws and terminal phalanges of the other digits emerging from the coverts. The fingers are not articulated, so I don't know why they were made as an independent piece that only functions to decrease the scientific legitimacy of the whole figure. It's a little frustrating. Maybe a clever customizer with one of the "Build-A-Raptor" kits can put one together that omits the hand piece entirely- I think that would look more on point than this. Luckily, the range of motion in the forelimbs allows you to hide this error reasonably well. In the photos I took for this blog, I followed the Dave Hone method of dromaeosaurid wing folding, with arms swept back against the sides, and you can see the final result looks good and you can't really see that the wings are made in the old "Dracula's cape" style. As you can see in the photos, the wings can be rotated into a variety of display positions. The shoulder joints can't be lifted up very far, and can't even become horizontal. This is actually probably correct for velociraptorines, which had less range of motion in the shoulder girdle, but probably not for most other figures in the Raptor Series. The legs, as discussed above, are a little under scaled, but not by much. The paint applications are once again very nice in this area, though the unpainted knee joints are a little distracting. The knees have both side-to-side swivel motion as well as hinge joints, so the legs can be bowed out to some degree. The ankle joints are simple hinges, but there is a separate hinge for the sickle claw and another for the two main toes, which can either be displayed spread apart or closed together by swapping the extra set included in the box. The scale texture on the tarsus looks nice. It has bird-like scutes but they seem to be arranged in multiple staggered columns like in Conchovenator, rather than the single column of broad scutes ("Big Bird style") which artists often default to. I do wish that rather than an extra pair of toes, an extra joint had been included here, to make the stance more flat-footed. The toe tips are in a constant upward curl if not in a running stance, otherwise you are stuck making it looks like your raptor is trying to become an ungulate. The knee joints don't seem to have a huge range of motion, but you can achieve a decent looking sitting position with the pubic boot resting on the ground and the legs folded underneath. The entire raptor series is billed as 1:6 scale, though obviously this is going to be a little closer to the truth for some figures than others, since there are small but significant size differences between all of them. It seems like Velociraptor was the keystone figure on which the other were based, and since Tsaagan and Velociraptor were about the same size, this figure should line up very well with the 1:6 scale claim. Since the skull is all that's definitively known, I'll use that element for scale calculations. Tsaagan's skull is 20cm long, and the head of the model to about where the rear of the skull should be is about 3.5cm. At 1:6 scale, a Tsaagan skull should be 3.3cm long. Based on the fact that the head is a bit too big compared to the body in the first place, I think 1:6 scale is dead on. The figure is about 28cm long if you exclude the tail feathers. That would yield a total body length of 1.7m in life, about the size of Velociraptor, which seems correct. People are often surprised by how small many of the classic dromaeosaurids are. Even knowing their real size, I remember being a little surprised by the fact that the holotype skull of Velociraptor looked like it could easily fit in the palm of my hand when I saw it in person. Posing my Tsaagan figure alongside a 1:6 scale Han Solo figure drives this point home. I've seen some people suggest that Silva include larger species in this line and just say they're a different scale, but as you can see, when posed next to a 1:12 scale Rey figure, it's too large to represent anything other than maybe Achillobator, Dakotaraptor, or Utahraptor, and certainly not the ever-popular Deinonychus. A Deinonychus would need to be some odd intermediate scale at this size. Overall, this is a really great figure marred by one or two slightly baffling choices that decrease its scientific accuracy. The proportional issues are slight, at least for this species, and are forgivable given the part sharing, mix-and-match nature of the Raptor Series figures. Despite having over 20 points of articulation, the joints don't feel obtrusive thanks to clever color patterning. Speaking of which, I'm not a fan of copy-pasting color patterns directly from modern species, and in some other figures in the Raptor Series, it's a little ridiculous. But the coloration here is different enough and generic "arid ecosystem camouflage" enough for me to give it a pass. My recommendation, from the point of view of being interested in nice-looking, scientifically accurate dinosaurs, is that this figure and quite a few of the others in this series are well worth it, despite the steep price point. There's literally nothing else like them on the market. That being said, other than the small environmental packs which include diorama pieces and small species or juvenile figures, I probably wouldn't buy a whole bunch of them to display together. The shared parts method of manufacturing simply homogenizes them too much. For me, the fun of displaying several of these together would be to compare and contrast different species of dromaeosaurids. Unfortunately, while any one of these would look great on their own, I feel like a whole set would unfairly minimize the differences, between these animals in both size and proportions, aspects which go well beyond color and skull shape which are really the only important differences found between figures in this series. Accuracy: 4/5 - I'd probably let this squeak by to 4.5 or 5/5 if not for those darn hands. History: 5/5 - First ever Tsaagan figure of any kind...? Sculpt: 4.5/5 - Very nice, sharp feather detail. Paint Job: 5/5 - Gorgeous choice of colors. Aesthetics: 4/5 - Easy enough to overlook the joints and pose it in a way that hides the more glaring scientific accuracy issues. If you missed the Kickstarter campaign, you can still get Beasts of the Mesozoic Raptor Series action figures from creative-beast.com. I've been tinkering with my three raptors (Tsaagan, Velociraptor, Atrociraptor) and while I like them overall, there are a lot of middling issues that really add up for me. Maybe the most egregious is that you can't get these things into an interesting pose on those tiny stands. There really needed to be holes drilled into the bottom of the body so that a peg could be securely inserted. Look to Figmas and J-hooks! They provide plenty of guidance! I will review all three sometime this month, but more from a toy perspective than pure accuracy perspective (besides you can't say much about Atrociraptor). You shouls take a look at some of the dino figures from Safari Limited https://store.safariltd.com/collections/wild-safari-prehistoric-world. They have a non-pronated, fully vaned and feathered Velociraptor (From what I can tell from the site's photo, they have even avoided the Microraptor-tail)! And a feathered T. rex! I loved this review, especially the part where you explain about the fingers and how they should really be. I just listened to your interview on I know Dino, just love it, especially because I study to be a Biology teacher and I love drawing. I know in the future I want to enhance my drawings to the point of paleo art. You inspired me even more. Holy Cow! People are just being commented on to advertise.